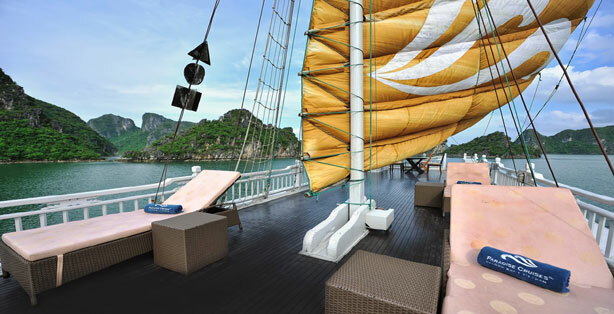 Paradise Privilege is an invitation for you to cruise around Halong Bay onboard your own private luxury apartment. 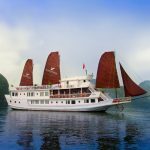 Our Paradise Privilege cruises have indeed been conceivred to become your home while exploring the majestic limestone site. Onboard Paradise Privilege, personalized service becomes a euphemism. 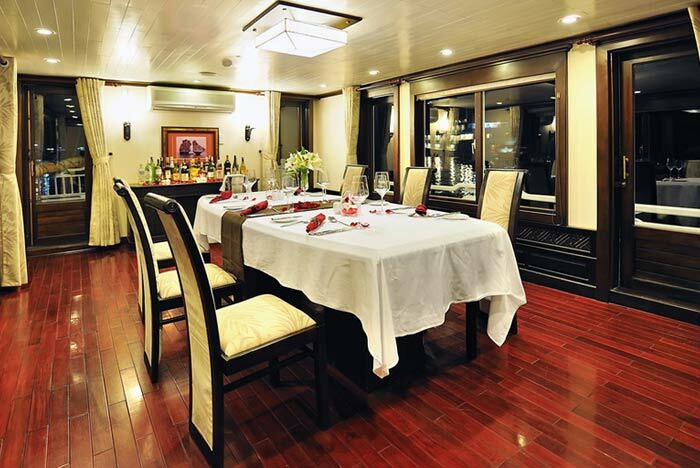 As you will be attended by your own private butler, every moment will be concocted according to your wishes, every second dedicated to your prime comfort and pleasure. 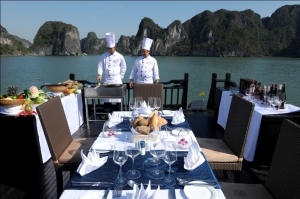 Paradise Privilege gives you the unique opportunity to create your own cruise in Halong Bay with a flexible itinerary: we don’t just send you an itinerary that is mass produced, our team listens to your requests and create a new program which best suit to your demands. From the list here below, you will just have to pre-select 03 options for a 2 day / 1 night cruise, 05 options for a 3 day / 2 night cruise. 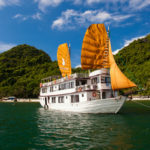 Our experts will then take care of your itinerary, maximising your cruising time in the bay and ensuring you can fully enjoy your relaxing and sightseeing time onboard Paradise Privilege. Please kindly note that activities availability is subject to change without prior notice. 1. 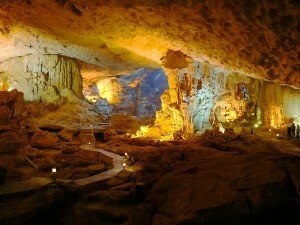 Visit one of the most beautiful and largest caves in the Bay, « Surprise Cave » (Sung Sot grotto) – 1 hour. 2. 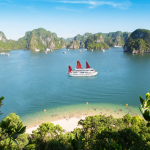 Kayaking* and swimming at the most beautiful Ti Top Beach in the Bay or hiking 400 steps up to the top ofTi Top Island for a panoramic breathtaking view of Halong Bay. – 1 hour. 3. Relaxing in a peaceful tranquil atmosphere in Luon grotto by local rowing boat or Kayaking* to explore the cave by yourself. Feeding the lovely monkeys in the lagoon. – 1 hour. 4. Learning about the local fishermen’s everyday life in a floating village, grasping the chance to understand more about them by visiting the fishing floating village museum. – 1 hour. 5. 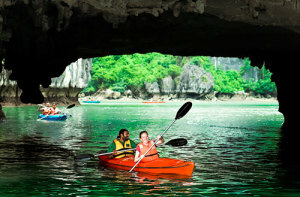 Swimming and kayaking* at the ideal location of Dark Cave and Light Cave. – 1 hour. 6. Swimming and kayaking* at one of the quiet and gorgeous beaches near sea gate « three peaches ». – 1 hour. 7. 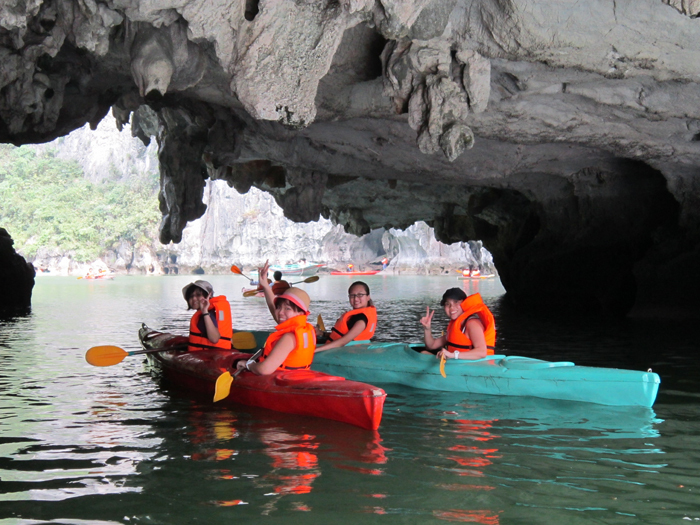 Exploring the three lagoon area, capturing the local living on the bay by kayak*. – 1 hour. 8. Biking along a peaceful sea view lane, penetrate in the daily life of the local people in the remote Viet Hai village in Cat Ba Island, trekking the trails in Cat Ba National Reservation Jungle (for the second day in 3d/2n program only; transfer for the day on Paradise Explorer. For safety reasons, we cannot take Paradise Privilege directly to Viet Hai). – 5 hours. 9. 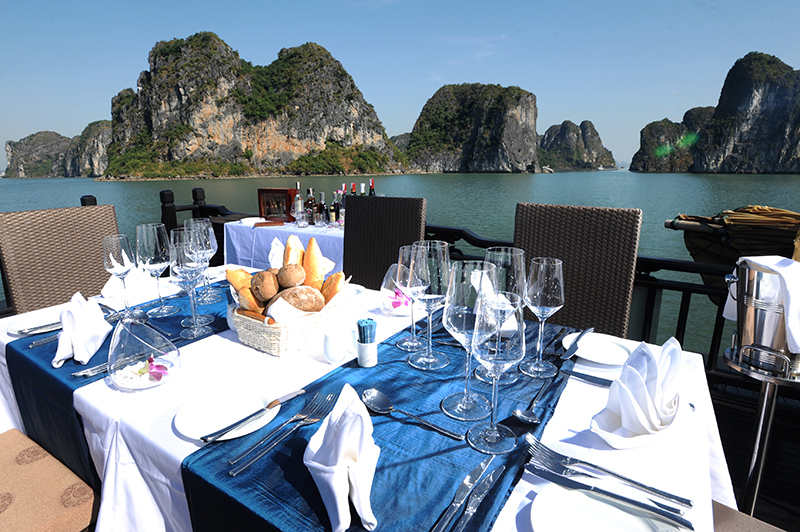 Start a day with a local fisherman, throwing the net and catch the fish for a tasteful dish in the day. Experience real local life. (Extra charges may apply). – 3 hours. 10. 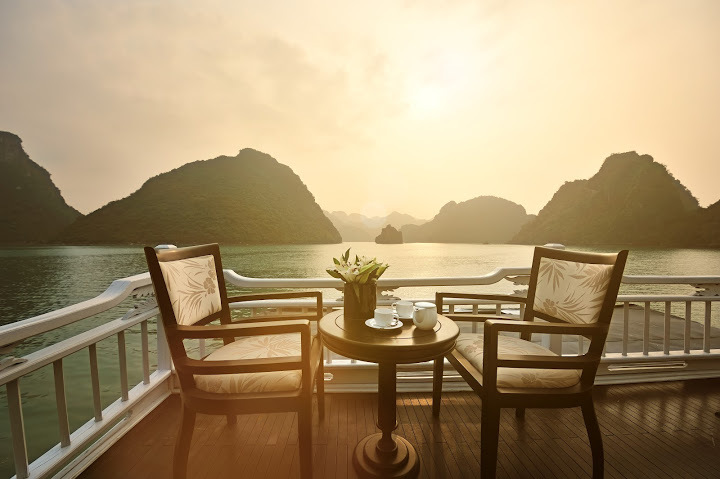 Relaxing at leisure on the yacht, cruising among the karsts while your butler will reveal the legendary stories about Halong Bay and the karsts on the bay. – At your desire. 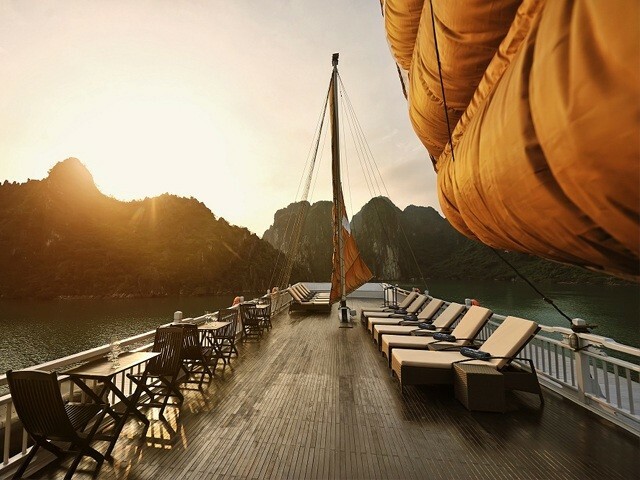 The earlier and the more we know about your wishes and requirements, the better we will be able to answer them and provide you with a genuinely personalised cruise. 1. Visit one of the most beautiful and largest caves in the Bay, « Surprise Grotto » (Sung Sot grotto) – 1 hour. – Full board meal: 01 lunch, 01 dinner, 01 breakfast for 02 days/1 night and 02 lunches, 02 dinners, 02 breakfasts for 03 days/ 2nights. 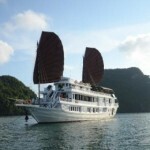 – Charter rate is for 06 persons including adults and children. – The FOC rate for children under 5 years old is applicable for 1 (one) child sharing a cabin with 2 (two) adults. 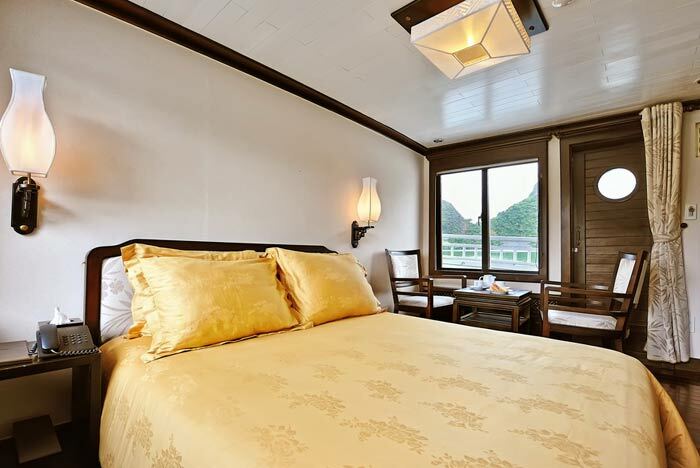 An extra charge of USD 30.00 per extra bed if required to set up in the cabin for 02 days/1night program or USD 42.00 per extra bed for 03 days/2 nights program. An extra charge of USD 12.00 per baby cot for 02 days/1 night program or USD 18.00 per baby cot for 03 days/ 2nights program if require. 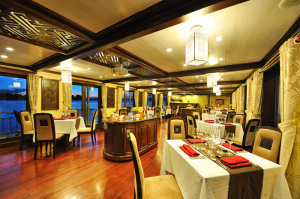 This extra service is subject to Paradise Cruises availability.